This country artist made two albums and then went into obscurity. Still, this album is pretty cute. The woman has a perky voice with an interesting quiver. She made two hits off this album: Son of a Preacher Man (No one sings it like Dusty. I'm biased.) and Sweet Baby Girl, which is the best song of this album although I also liked Come on Home. As with the usual country albums of the time, she does some covers. Some of them are You ain't woman enough, D-I-V-O-R-C-E, and Make the world go away, which I thought was the best cover on this record. 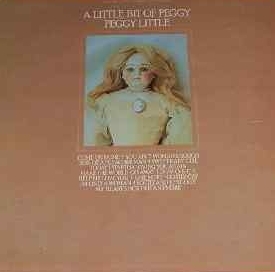 If you are looking for forgotten country singers of the past Peggy Little is worth investigating. Loretta Lynn wrote the back of the record.